Captain Cecil Aubrey Bradford of the Yorkshire Regiment, attached to the Nigerian Regiment. Son of the late Lt-Col O. J. Bradford of Welparke, Lustleigh and his wife Mary Ann Ellen Bradford; husband of Mildred (née Hillyarde). Born in Chagford in 1899. Died 31 May 1918 aged 19. 24 April 1917. Drowned when travelling home on S.S. Abbosso which was torpedoed by a German submarine. 72114 Private Percival George Brimblecombe of the 9th Battalion, the Cheshire Regiment. Son of Walter and Mary Brimblecombe of Lustleigh. Born in Chagford in 1899. Died 31 May 1918 aged 19. 12006 Private George Bunclark of "D" Company, the 10th Battalion, the Devonshire Regiment. Son of John and Mary Ann Bunclark of Lower Coombe, Lustleigh. Born in Hennock in 1893. Died 10 February 1917 aged 24. 37456 Private James Ernest Hine of the 1st/5th battalion, the Duke of Cornwall's Light Infantry. Son of the late James Hine and of Emma Hine of Kelly Cottage, Lustleigh. Born in Torbryan in 1899. Died 24 September 1918 of illness while a Prisoner of War aged 26. 16435 Sapper Samuel Maunder of "G" Coy, the Royal Engineers. Son of Elizabeth Maunder of Lustleigh and the late William Maunder. Borni n Lustleigh in 1888. Died 5 June 1915 aged 26. Buried in the churchyard at Lustleigh. 3193 Private Edwin Wilfred Wrayford May of "C" Coy, the 24th Battalion (the 2nd Sportsmen's Battalion), the Royal Fusiliers. Son of Edwin and Louisa May. Born in Lustleigh in 1891. Died 4 July 1916 aged 25 when he received a direct hit from a shell. Captain Richard Francis Newdigate of the 3rd Battalion, the Border regiment. Ony son of the late Lt-General Sir Henry Newdigate KCB and his wife Lady Newdicate. Born in Eastbourne in the June Quarter of 1894. Died 4 September 1916 aged 22. 169197 Ordinary Seaman John Ridler of the Royal Navy, HMS Vivid. Son of Thomas and Eliza Riddler; husband of Alice Maud Riddler of Lone Park, Lustleigh. Born in Chudleigh 20 April 1877. Died 12 April 1917 aged 40. 163784 Gunner Stephen Voaden of "B" Battery, 156th Brigade, the Royal Field Artillery. Son of John and Ann Voaden of Wonford. Born in Heavitree, Exeter in 1883. Died 28 October 1918 aged 36. Buried in Heavitree Churchyard. 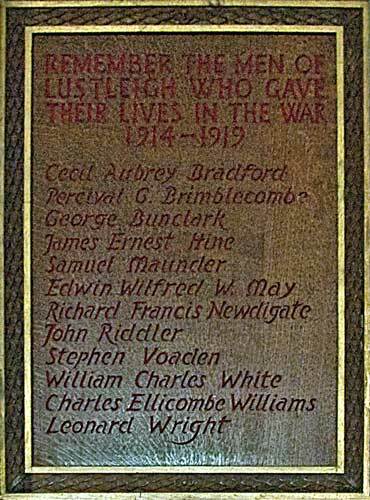 Gardener to Brigadier Raymond Williams CB who then lived at Pinkhurst, Lustleigh, and whose son was also killed (see below). J/17154 Able Seaman William Charles White of the Royal Navy, HMS Vala. Brother of Mrs. Mary Rowe of 29 Waverly Road, Freemantle, Southampton. Born in Wells, Somerset, 27 February 1896. Died 21 August 1917 aged 20. Captain Charles Ellicombe Williams of the 7th Battalion, the South Wales Borderers. Son of Brigadier General Raymond Burlton Williams CB and his wife Ella Maud Williams (née Radcliffe) of Ashprington House, Totnes. Born in Plymouth in the December Quarter of 1889. Died 27 May 1917 aged 27. 240320 Private Leonard Wright of the 5th Battalion, the Devonshire Regiment. Son of John and Elizabeth Wright of Moor Wood, Lustleigh. Born in Lustleigh in the June Quarter of 1897. Died 20 July 1918 aged 21. Killed by an explosive bullet at the Marne.